When the Napa City Council extended its red-light camera contract for another year in June, the big unknown was whether the program would be able to pay for itself without right-turn cameras at the juncture of Highways 12 and 121. These cameras had been the red-light camera program’s biggest moneymakers, but had generated the most controversy. When the council ended camera enforcement of right turns from southbound Highway 29 onto 12/121, officials voiced concern that financial solvency of the entire camera system was in jeopardy. Advocates of red-light cameras need not have worried. Even without right-turn camera enforcement at 12/121, the city continues to issue nearly the same number of citations citywide that it did in the spring, before the program was suspended for two months because of a court dispute. 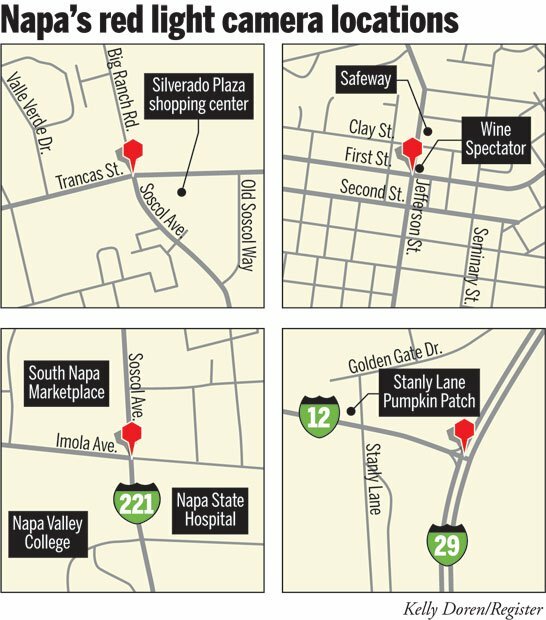 The numbers suggest that the cameras, which cover four Napa intersections, continue to more than pay for themselves and are not costing the city money, according to a Register analysis. In September, when ticketing resumed as before, the city issued 423 red-light tickets despite the elimination of right-turn citations at 12/121, according to highwayrobbery.net. The number of citations dropped in October to 301, but that’s still above the city’s estimated break-even point for leasing the cameras from Redflex Traffic Systems Inc.
Before being disabled over the summer, the right-turn cameras at Highways 12 and 121 generated 90 percent of that intersection’s tickets and were the city’s biggest producer of citations, Troendly said. According to the latest data, this intersection now trails the intersections of Soscol and Imola avenues and Jefferson and First streets. It now generates about as many tickets as the intersection of Trancas Street and Big Ranch Road, which in 2011 produced the fewest tickets. So how, with the steep decline in citations at 12/121, have ticket levels citywide remained stable? Mostly because of a spike in citations at Soscol/ Imola. In May, 133 tickets were generated at Soscol/ Imola. When the cameras were turned back on in August for a 30-day trial period, 256 warning notices were mailed to red-light runners. In September, when enforcement resumed, 274 tickets were sent out. Councilman Mark van Gorder questioned whether, given this spike, the cameras are changing people’s driving behavior for the better, as police had predicted they would. Troendly dismissed any notion that the Napa Police Department, which must approve every alleged violation provided by Redflex, is giving out more tickets at Soscol/ Imola to make up for the drop in tickets at 12/121. “We use the same criteria (in reviewing possible violations) as we always have,” Troendly said. The increase in citations at Soscol/Imola could be due to seasonal traffic changes at this location, Troendly speculated. “There could be higher volumes of traffic this time of year. ... School starts back up,” he said. Fall classes at Napa Valley College, located south of Soscol/Imola, began in mid-August. “It might be this migration of new students who weren’t traveling this intersection before,” Troendly said. Mayor Jill Techel, the only member of the City Council to vote against installing the cameras three years ago, called the numbers “concerning” and said she’d like to see how many motorists are being photographed by Redflex, not just those receiving citations from the police department. “I’d be interested to see if there are, indeed, more people being caught or if there’s a different interpretation,” she said. Regardless of why more motorists are being nabbed at Soscol/Imola, the fact remains that during September and October, the city appears to be covering the cost of its red-light camera program, and then some. 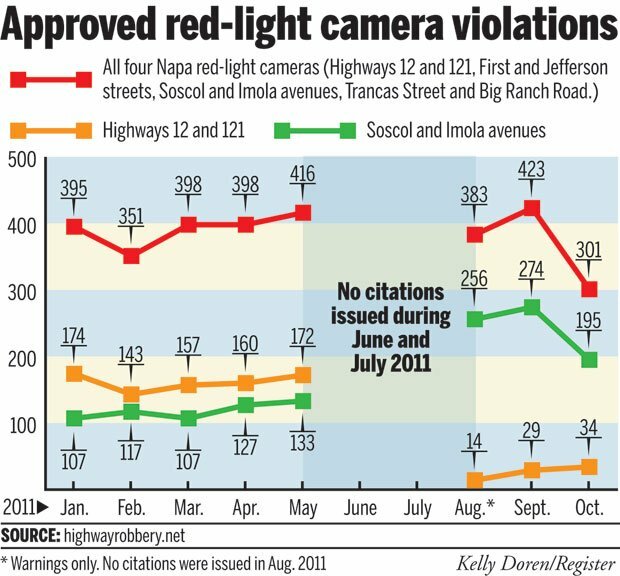 According to the city, Napa pays Redflex $5,670 each month for the cameras at Jefferson/First streets, the intersection with the lowest number of lanes policed by cameras. It pays $6,000 monthly for each of the other three intersections. For each ticket, Napa receives just over $146 of the $476 total fine, according to the city. If all motorists paid the full fine amount, Napa could support its program as long as it issued roughly 162 tickets each month. Troendly noted that some motorists may never pay their tickets, or do so over years, and some citations may be dismissed in court. Thus, although 423 tickets were issued in September and 301 in October, it’s not yet known for certain whether the 162-ticket break-even point was reached. Given the new citation pattern, Troendly said the city may try to renegotiate a lower price with Redflex. Troendly is currently reviewing the ticket numbers to determine whether the city is staying in the black. Overall, the number of incidents caught by cameras has declined since they were installed in 2009 and 2010, Troendly said. The police department and members of the City Council have long maintained the cameras are intended to make Napa roads safer, not generate revenue. Once the Redflex bill is paid, the city uses the additional money for traffic-safety programs, like placing electronic speed-limit signs near schools, Troendly said. Though motorists may not like the high fines, which are set by the state, Councilman Peter Mott said he still thinks cameras are good for Napa. “I think they still provide a public safety benefit,” he said. Van Gorder said if anyone who received a ticket can show him a video proving they were not hazardously running through an intersection and received a ticket for slowly rolling on a right turn, he will bring the matter before the council and vote to end the program. Mott said he has yet to hear anyone who received a ticket argue they were not guilty of running the light. Napa's red-light cameras have been heralded as a champion of safety and loathed as the long (robotic) arm of the law. Interesting news article, first that the fine is only $75 there, and secondly that they require a driver to stop at a stop line which is 3 car lengths before the crosswalk. There is no way that a right-turning driver can have a good view of conditions in the intersection from that far back! It proves once again that requiring a full stop for a right-turning vehicle is nothing but unnecessary harassment. Vendors have been busted in the past changing the "violations" to suit their politcal and business needs. Of course not, and I'm willing to take my licks when ticketed. I fully understand that the traffic laws have to be written for the lowest common denominator type of driver. Should your TomTom not alert you to the police officer who happens to watch you slide around the turn then stops you (with flashing red lights) and tickets you, you might be lucky enough to talk a judge out of it, but probably not. You are welcome to continue your delusion, as an independent free citizen of these United States, that you are no slave to laws that serve no use in your self-prescribed universe. But someday, should you acquire one of these little awards, rest assured that your insurance company will exercise it's free-market rules by labeling you NOT so careful as you think you are. In other words, watch your insurance rates rise. I'm not quite so "hung up on slavish obedience to the letter of the law" as you may think. But I always come to a full stop at stop signs and red lights. It's just easier to do that than try to argue it otherwise in court. My time is too valuable for that. and now you are the arbiter of which traffic laws should and should not be obeyed JR? And you sir are hung up on slavish obedience to the letter of the law instead of its spirit, which is to promote the expeditious and orderly flow of traffic while maintaining safety. As long as the right-turning driver yields the right of way, safety is not compromised. JR wrote: "Do I roll through stop signs? Mostly not. The only time I may roll through at about 2 MPH is when I'm making a right turn and there isn't any other traffic (or a pedestrian) around me." And I rest my case! No I am not obfuscating, I am merely mentioning the requirement of the law. I don't know of any states or their traffic laws that are ambiguous about what a red light or red stop sign means - STOP! But you JR, have rationalized that you are a "safe" driver and therefore have the authority to decide whether or not to observe the law. Like many here, your argument is neither logical nor intellectually honest. It is merely the justification of bad habits and refusal to adjust to what you don't like. Speaking of dangerous drivers. How about police officers? they can speed? they can talk on cell phones? use computers? seems pretty dangerous to me. Laws should be for everyone. I understand in emergency they need to speed but other than that they should be following the same laws we do. It's obvious that Mr. VanGorder is running for the Board of Supervisors. He recognizes that the cameras he voted for while on the council are not popular. This is a program that he supported without question as a council member. Now he has a question about them? Politics are amazing even at the local level. Given the overall trend of the graphs in this article, that scenario will never happen. There will always be an influx of new tourists and new college students who are unfamiliar with the local streets. They are the ones who will bear the brunt of this automated enforcement. As a long time resident, I have the camera-equipped intersections memorized, so they will never get a dime from me. Interestingly, I recently purchased a new TomTom GPS, and it gives off loud warning beeps when approaching one of these camera-equipped intersections. Actually only 2 intersections are generating right on red citations, since one of the intersections has a yield on right. And I strongly disagree that rolling right turns are not more dangerous than stop and turn on right, mainly because of pedestrians and bikes (especially ones riding illegally against traffic but that is another story). I agree that right on red at 29 and 12 are not about safety since there are not pedestrians and bicycle riders going the wrong way. But at the other intersections I think a right on red citation is a legitimate saftey issue. Again, you are obfuscating the distinction between failing to yield the right-of-way versus the practice of making a right turn at a red light without coming to a complete stop. Making a perfunctory stop way back at the stop line may satisfy the law but the driver often can't assess the intersection from that vantage point. Do I roll through stop signs? Mostly not. The only time I may roll through at about 2 MPH is when I'm making a right turn and there isn't any other traffic (or a pedestrian) around me. The primary purpose for traffic laws is safety, and I never compromise safety. So? What is the point you are trying to make? I'm willing to bet that the overwhelming majority of the total tickets from red light cameras are still for right turn violations. republicrat1 if you were a former cop then you would know that cops have more important things to do than waste time sitting on the side of the road waiting for a mistake. So the computer system seems like a more efficient way to punish offenders. Again the easy way for Napa citizens to force the city to get rid of the red light cameras is to FOLLOW THE RULES of the road instead of trying to justify their bad driving habits. Once the citations drop below the break even point, the city will deactivate the cameras and cancel the contract with RedFlex. We would all be better off for it. R K Savage - the law has always established that you stop for a reasonable amount of time to assess whether it is safe to proceed on the red. States may differ on that but to me the 3 second rule is not unreasonable. That is essentially 3 head turns (1 to the left, 1 to the right, back to the left just to make sure) before making the turn. People develop sloppy driving habits over time, it's a fact any cop can verify. It's just human. Is this a $$ generator? Sure it is! But so is putting cops on the side of the road who stop red light runners or speeders. Why is that any different? This $$ generator takes advantage of that sloppy driving habit I mentioned above. Does it actually reduce accidents and save lives? That's hard to prove one way or the other. If a conscientious driver receives one of these $500 awards, I suspect they take it to heart and modify their driving, but you can't prove it by police files. But you might with insurance files, they too prey on human fallibility. First, I would like to point out that I once lived in Napa and was a policer officer. I currently live in another state and some cities have installed red light cameras from same company. The fine is $60. So if California gets almost $500- whats up. Were they poor negotiators with Redflex or did they want it to be a revenue generator? I do not want a computer making a decision of issuing a citation, although it is reviewed, by an officer. Nobody but Redflex knows all the circumstances and parameters used to obtain the photo. In discussing the matter-most officers I have worked with believe in decretion and so do I. Here most cities that have tried this system and are removing them at the end of the their current contract. Mainly, because their has been no reduction in accidents. I understand why California is doing this and its about revenue. Revenue sources are drying up, costs increasing and it effects very few citizens. Least way to get revenue without many complaints. I agree that running a red light is dangerous and puts peoples lives at risk. But I think the issue here is the "Right Turn" Red Light. at most all intersections you can turn right on a Red light after stopping if it is safe. Now if these lights are catching people turning right without stopping that is good but as I understand it you get a ticket even if you stop first? I thought Right on red was legal after stop, as most people would. If Napa is preying on people who stop and proceed when safe than that is simply wrong and serves no purpose but to generate revenue. Does Napa have a different Right on Red rule than the rest of the state? So JR you didn't answer my previous question - do you stop at stop signs? If so, how is that different from a red light? Would you object to cameras at intersections with stop signs? Would you object to a cop giving you a ticket for rolling through an intersection with stop signs? JR wrote: "Your example illustrates the danger of failing to yield the right-of-way. It does not illustrate any perceived safety concern with making a right turn at a red light without coming to a complete stop. I never advocated failing to yield the right-of-way." Your rationalization is utterly amazing! The driver essentially ran through a 3 way stop then proceeded to do the same against a red light. The law is very clear about this because people tend to adopt lazy habits. Rolling through red lights and stop signs is a lazy habit that can lead to catastrophic results. Stopping and assessing the situation is a better habit to have. It is also the law. So you essentially feel that you have the sole discretion to follow or ignore laws as you see fit? Is this how you teach or taught your children to drive or did you attempt to teach them the rules of the road which are mostly based on common sense? "Before being disabled over the summer, the right-turn cameras at Highways 12 and 121 generated 90 percent of that intersection’s tickets and were the city’s biggest producer of citations"
so with the cmaera that generated 90 percent of the right-turn violations shut down, the red light citations are still paying for themselves. Ah, the end justifies the means! Let Mott put his money where his mouth is. If his only concern is safety, then he should vote to remove right turn violations from the program, as they have done with the 29/121 intersection. Glad to see that Van Gorder is coming around to a more reasonable viewpoint. Not so. The only reason the cameras are still paying for themselves is because three of the four intersections still ticket right turn violations, which is the majority infraction. Not sure what you are talking about. Three of the four intersections still ticket right turn violations. Your example illustrates the danger of failing to yield the right-of-way. It does not illustrate any perceived safety concern with making a right turn at a red light without coming to a complete stop. I never advocated failing to yield the right-of-way. And to answer your other question about the increase of tickets at Soscol and Imola, I would suggest seasonal wine crush and tourism. For many new tourists, who don't know the valley and come up from the south-east, the natural off ramp is the first one they see which says Napa & Lake Berryessa. I bet that intersection will show that trend in the years to come. "For sake of argument, let us accept that there's a societal need for drivers to make a full/complete stop before turning right." Perhaps one needs to clarify here that you are NOT ticketed for a rolling turn against a green light, just the red. Suggest you review the DMV test booklet - RED always indicates STOP. Do you have some alternative definition for that symbol? Same for RED stop signs. Why is the fine so high? You will have to ask the CA state legislature which makes the laws (we are a nation of laws, no?). It has been my life experience that the only thing people really get (and particularly Americans) is the effect on their wallet. If it were a $50 fine, people would care less. Witness the cellphone/driving law - initially a warning followed by a $25 fine, now readjusted to $20 (first offense) followed by $50 for additional offenses. And has that discouraged people from phoning and driving? Bet $300 would get their attention real fast. For sake of argument, let us accept (for you lawyers, "stipulate") that there's a societal need for drivers to make a full/complete stop before turning right. That leaves the question of whether a $500 fine is needed to drive home the point. I think that a far smaller fine would get the same result, without taking the food off some people's tables. After all, Napa's parking tickets work to stop parking hogs, and they cost only $33. So, I would ask the Hawkish posters here to answer: Why does the fine have to be so high? And, if they are game, the Hawks could also let us know if they are OK with the lack of any good explanation (other than the suggestion that the program needs the revenue in order to break even) for the big jump in ticketing at Soscol/Imola. republicrat1 wrote: "I have a question, are tickets for running red lights at locations without camera bringing the same or less revenue?" It's the same price for the violation. So we actually probably make less money due to Redflex's cut versus that of an actual cop in person. Flip side is if you don't like the cost of more government, you probably don't want to hire more police just to take care of the red light runners. So it is cheaper in the long run to have the cameras versus real people and retirement/health programs, et al. But basically I think you just don't like the law or the consequences when one breaks it. As I have said before - an easy solution to denying the city this "revenue generator" is to slow down, come to a complete stop, smell the roses for 3 seconds (not so long in the scheme of things) then go merrily on your way ticket free! I know, I know - sounds weird, but it works! The point is, your loved one could just as easily been hit by a driver who made a perfunctory stop way back at the stop line, then proceeded into the intersection. The driver often does not have a good view of the intersection while stopped back at the stop line, so what is the safety aspect of stopping there? What counts is to observe due caution when actually entering the turn. So here we are again, same old arguments by those who don't feel the law should apply to them because they have SUPERIOR driving skills and driver awareness - yawn. So JR do you stop for stop signs or just conveniently roll around the corner because everyone else is doing it? Do you find a difference between stop signs and red lights? How long has this law been on the books in the state of CA? Yesterday I watched a lovely specimen pull out of the Red Hen parking lot, fly to the nearest stop sign at Wine country Ave where he didn't feel like coming to a complete stop, so he rolled around the corner then decided it wasn't worth coming to a complete stop at Hwy 29 either, and continued with a right turn onto the highway. He misjudged the speed of the oncoming cars and nearly got rear-ended. He probably over-stayed his lunch and was late for work. No JR I don't feel like a "self-righteous" naysayer, just amazed at the sheer arrogance of the whiners here. With a click of the mouse redflex turns the yellow light time back to 2.8 seconds. If your car is moving at freeway speed on 29 can you safely stop your car in 2.8 seconds? I didn't think so. when you show me the exception to the traffic laws for that right turn, Jr, I will be happy to reconsider but if you read the first graph of the story, the number of tickets does not include right hand turns.. Thank you notpc and Raven. John Richards seems to think that there is some ulterior motive to those that believe enforcing the law is a good thing. I have personally witnessed a "slow speed right turner" barely miss my mother in law while she was walking with my daughter in a crosswalk a few years ago. Just didn't see them...doesn't mean they wouldn't have been hurt! Slow doesn't do it. STOP at a red light or Stop Sign is what does it, besides being the law. I wish we had cameras on the 29/121 intersection for north bound left turners. Every morning I witness 2-3 cars (a inordinate amount of large trucks as well) just put pedal to the metal to run that red light. I see it with the East bound traffic on Redwood Rd running the red to cross the freeway toward BelAire...many times it's moms with kids! Endangering your child to make up 45 seconds? I am also extremely disappointed with Mr. VanGorder. It sounds like he is trying to make friends, not helping to enforce our citys laws. “The fact (the number of citations has) gone up is extremely concerning to me, enough so that I’m not sure we should continue the program,” van Gorder said. “It’s bothering me more and more.”...he should also look into how many drunk drivers are at the minimum level...maybe only DUI's at .10% should be arrested...then we could look at the increase in drug arrests...maybe NPD should only arrest those with a pound or more of dope...then Van Gorder could look at how much is stolen in a burglary or robbery and only go for the high dollar arrests...we could do the same for gang bangers....they need to have 3 or more weapons on them...nice slippery slope Van Gorder...and since when did you start sitting on the bench? Don't you just love how the self-righteous naysayers make absolutely no distinction between someone who plows full speed through a red light and someone who cautiously makes a low speed right turn? It gives you insight into what the naysayer's true motive is. The bottom line is if you run a red light your endangering innocent people. Just because it happens at an intersection that is monitored by a red light camera has no bearing on the issue. Red light runners have broken the law and endangered other people. As much as I would like to see the fine start lower for the first offense and go higher with subsequent violations this program should change peoples driving habits. Just because there are more violations doesn't mean the cameras haven't had a positive impact on safety. If you have a repeat offender eventually they will lose their license. Councilman Van Gorder is playing politics with this issue how can you be against a program that promotes public safety? The problem is that redflex is in it for the money and will target the public accordingly. For instance the turn from 29 s to 12 w common sense tells you if it's clear you go. The real danger at this intersection is 12 E to 29 S. cars go from a 90 degree turn onto 29 with no merge lane. Don't tell me this is about public safety. "Van Gorder said if anyone who received a ticket can show him a video proving they were not hazardously running through an intersection and received a ticket for slowly rolling on a right turn, he will bring the matter before the council and vote to end the program." 2. Lieutenant T. suggested that the big increase of ticketing at Soscol/Imola was seasonal, but that claim isn't borne out by the facts. The website mentioned in the article has Soscol/Imola data for the same time last year, and there was no Fall increase. So, what is going on? Did they shorten the yellow? We can only hope that a whistleblower will step forward and tell the truth. If they are making money, We are still running to many red lights. If we stop running the lights. The program will go broke, The city the voters don't control will still keep them.That is just how this city works. This is about revenue, not public safety. As a child I was taught that police officers were my friend. Whenever I would see a police car I would wave. I still wave, but now it is the one finger salute. I strongly believe that the first priority of Napa police is to generate revenue. The Napa police department has a very big public relations problem. The city council has the same problem, but at least they can be voted out of office. Keep up the good work. Red light runners are dangerous people, they will kill someone you love. They must be stopped. WOW....the Police Department is showing this member of the City Council that people are continuing to violate the law and it is bothering him to the extent that the police department needs to stop this modern enforcement tool....because of what reason? Perhaps Mr. Vangorder would rather hire 20 more motorcycle cops to enforce these violations or just wait till someone gets killed when a red light in run. Are you upset Mr. Vangorder that a machine is now catching traffic violators instead of expensive law enforcement officer? Or do you just want to get rid of this program because it is making law violators mad? Also, the city needs to get monthly info about tickets issued and all city cost to review,issue ticket and city representative at court procedings. Further, a running 5 year study comparison on accidents at these intersections and how they compare with like intersections throughout the city. Its a revenue generator. Nationally, stats reflect that it does not reduce accidents. That is what we are talking about. I have a question, are tickets for running red lights at locations without camera bringing the same or less revenue? Unless less-then we are punishing drivers when higher fees that are collected and no cameras are in place. If same fee- then collecting for city and state with no higher cost to either. Either way the public is getting the shaft. Just curious about what is the fee for both camera/no camera. Either way I would argue, in court, the injustice of the program.